This 105-acre island property is connected to New Rochelle by a drawbridge built in the 1920s. 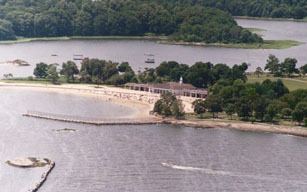 After Playland, Glen Island is the second most widely used park in the County Parks system. One of Westchester’s unique jewels, it was initially developed as a summer resort by John H. Starin. The original design exhibited the five cultures of the western world on individual islands linked together with piers and causeways. Today the islands have been merged with substantial fill areas totaling 130 acres and providing a beautiful crescent shaped beach with access to the Long Island Sound. Glen Island Park also offers picnic pavilions, reservable and open picnic areas, boat launching, pathways, a catering hall and a restaurant, formerly Glen Island Casino of Big Band era fame. Cannons, sculptures and castles with coursed rubble stone, arched openings and round towers still remain from the days of John Starin’s resort. The castles, reminiscent of those in Germany's Rhineland, were constructed on their present site in the late 19th century for use as a beer garden and restaurant. The boat ramp handles 65-70 launchings per weekend. The bathhouse was originally built in a Neo-Georgian style with a cupola marking the center of the front façade. A courtyard looks out to the beach and is completed by a colonnade. The bridge, bridge house, seawall and castles are all eligible for listing on the Register of Historic Places. Westchester County residency required for admission with either County park pass or a valid New York State driver's license with a Westchester county address. Parking fee: $5 with Park Pass, $10 without Park Pass -- weekends only in May and September until Sunday, Sept. 29. Daily 5/25 through Labor Day.